In some ways, I was pretty late to the whole Moneyball thing. I didn’t see the critically-acclaimed movie, released in late 2011, until well after it had been released on DVD. And the book that I recently finished was published in 2004, so I was about 8 years behind there. 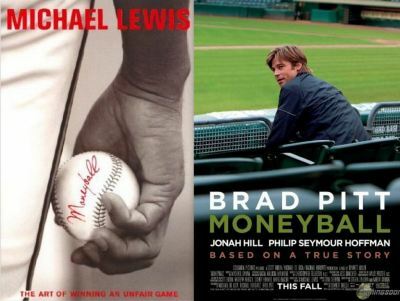 But I’ve been familiar with some of the concepts central to the theme of Moneyball for quite some time. I was a pretty dedicated fantasy baseball nerd for years (I retired a few years ago – it was consuming too much of my time). In the pursuit of fantasy baseball championships, I turned to advanced baseball analysis and statistics, like those available on fangraphs.com. Although the statistics normally used in fantasy baseball are based on traditional baseball statistics, I found that using sabermetric analysis could still help me tremendously in predicting future performance. It allowed me to look at players differently than most of the other people in my league, identifying players whose surface stats were either inflated or depressed compared to their actual skills and superior traditional statistics (often in very small sample sizes). With that valuation analysis I was able to consistently buy low/sell high, deriving substantial benefits (i.e., I almost always won). Ok, maybe it is about baseball, technically. Billy Beane is a former baseball player turned general manager of the Oakland A’s, a small market team trying to compete on the field while being restricted by a payroll literally several times less than the richest teams. On base percentage (OBP), old school scouting vs. new age statistics, big market teams vs. small market teams, etc. So it is about baseball on the surface. But it is replete with lessons that are applicable to business, and life in general. Here are a few of the themes that I identified while reading. What is the real problem you’re trying to solve? Why do we do things the way we do them? Is there a better way? “Oh, you mean like Babe Ruth?” says Billy. Everyone laughs, the guys on Billy’s side of the room more happily than the older scouts across from him. “Sometimes low energy is just being cool,” says Billy. “I repeat: we’re not selling jeans here,” says Billy. Do you get caught up in the fact that you don’t fit the mold, resulting in lack of effort and not rising to your potential? Do you limit others’ actual production or potentials with the same kind of thinking (and resulting actions) regarding them?